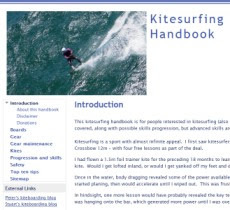 I have been researching kitesurfing distance records out of interest. I really enjoyed the downwinder we did from Ricketts Point to Hampton. It really piqued my curiosity about how far people have actually travelled with a kite and what may be possible. So far, the best documented distance record I can find is that of Kirsty Jones who set a distance record for a kiteboard when she travelled 225km (140 miles), crossing from Lanzarote in the Canary Islands to Tarfaya, Morocco, in about nine hours on May 13, 2006. Here is a video of Kirsty's feat. A record combination of distance and speed of 207 km in 5h 30 was set by Raphaël Salles, Marc Blanc and Sylvain Maurain on July 24, 2007 between Saint Tropez and Calvi, beating Manu Bertin's previous record of 6h 30 for the same journey. Their average speed was almost 38 km/h. I have updated the kitesurfing article in Wikipedia with this information. Allison Shreeve attempted to windsurf across Bass Strait on 26 March 2009. The planned route was 130 Nautical Miles (250km) between Stanley in Tasmania to Inverloch in Victoria. However, she abandoned the attempt out due to mild hypothermia and cramps around 80 kilometres off the Victorian coast late on Thursday afternoon after leaving Tasmania just after 7.30am (AEDT). She had to contend with strong winds soon after leaving Stanley on Tasmania's northwest coast and suffered cramps early in the crossing. Only one other person has ever windsurfed across Bass Strait before - Nick Maloney, who took 21 hours to manage the feat in 1998.